A parallel case to the Bundaberg scandal is that of Riad Sattouf, a boy born in France to a French mother and a Syrian father, who later took the family back to his home village in the Middle East. There he was affected by the traditional habits of the past and decided that he ought to get his son circumcised. Riad's account of this episode vividly evokes the magical world of a typical 8-year old, his terror at the approaching roue de douleur (wheel of pain), as his cousins refer to the event, the agony of the operation, his horror at the outcome, and his slow physical and mental recuperation. Despite the humorous approach and comic-strip presentation, the result is a sobering indictment of the tyranny of custom and of parental cruelty. PARIS France is paradise to the comic book lover. Close to 1,500 new BD books (BD stands for bande dessinee, or comic strips) are produced each year to satisfy the incessant appetite of mainstream and alternative audiences. Each year, the International Bande Dessinee Festival in Angouleme hosts up to 400,000 fans. Accordingly, if you write and illustrate BDs, France is the place to be. Comics are considered an art form, and cartoonists are worshipped. It's hard to know if Riad Sattouf would have written and illustrated comic books had he grown up somewhere else, but it's clear that this baby-faced 26 year-old has a lot to say, and comics are the perfect medium for him. Sattouf burst into the world of BD's last year with the publication of the Manuel du Puceau (Handbook for a Virgin) for adolescents, and Les Jolis Pieds de Florence (Florence's Pretty Feet) which won the prestigious 2003 Rene Goscinny prize for best BD writer. His Manuel du Puceau, which does away with any notion of the politically correct, recounts the trials and tribulations of a pimply teenager with a raging libido. Les Jolis Pieds de Florence introduces the adult reader to Jeremie, a Franco-Libyan nerd who creates video games and is hopelessly in love with Florence, a co-worker in his office. Nothing besides his name and a few vague allusions to the Arab world could prepare the reader for Sattouf's next book, which can be termed a tragi-comic autobiographical bombshell. 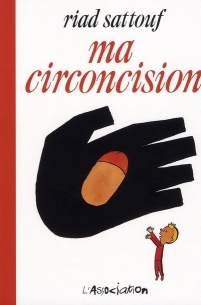 Ma Circoncision (My Circumcision) came out this year in a collection for teenagers but could very well be for adults. Funny and terrible, it is the gruelling tale of an 8-year-old boy who lives in a Syrian village and is faced with his impending circumcision. How much of Ma Circoncision is autobiographical? "One hundred percent," said Sattouf. The son of a French mother and Syrian father, Sattouf was born in Paris but lived until age 11 (except for two years in Libya) in Ter Maaleh, a small village near Homs, in Syria. (Sattouf describes Homs as resembling the spaceport city of Mos Eisley, in Star Wars). In Ma Circoncision, Sattouf recounts how one day his cousins notice that he isn't circumcised. He is immediately accused of being an Israeli, the worst insult the children can think of. Sattouf, who was blond as a child, lies in bed wondering if he is adopted. "Perhaps I really was Israeli?" "From the very first day my difference was apparent. I was the only foreigner in the village ... I went to the Muslim school and studied the Koran. We travelled to France sometimes so I knew there was another way of life. But the village was a place out of time, in a parallel dimension." Sattouf, 8, lives in a fantasy world in which he and his cousins are Cimmerian warriors (they've seen a video of Arnold Schwarzenegger in Conan the Barbarian countless times). Corporal punishment at school is common and children are subjected to beatings on the soles of their feet. Their teacher, who looks like a "degenerate James Dean," rants to the children that "France and Europe are friends to the Israelis." The classroom brutality and ignorance described by Sattouf is such, that the publisher's lawyer strongly recommended at the beginning of the book, a disclaimer which reads: "This book tells a true story, situated in a country in which the totalitarian regime formats children to a single mode of thought. It is against circumcision. It is not an incitement to racial hatred but bears witness to the way a society produces racial hatred." Sattouf writes that his father decides his son should be circumcised. The next pages are a countdown until the unhappy event. The fateful day rolls around and the circumciser looks like Conan the Barbarian. "How many Syrians look like Arnold Schwarzenegger?" writes Sattouf. "Only one, no doubt, and he was in my living room!" After a long and painful recovery, Sattouf finds out from his father that Israelis are circumcised as well. Sattouf, who has not seen his father in 14 years, portrays him in Ma Circoncision as a harsh, unfeeling man. " Of course my father was more human than in the book. His moods alternated but there was a certain inflexibility about him, he never doubted his behavior." His father was a university professor with two doctorates from the Sorbonne. He was "very open-minded and totally emancipated. He never prayed, ate pork, but then his past caught up with him." Sattouf's father became deeply religious after a stint of teaching in Saudi Arabia. "I do have a kind of nostalgia for the village. There was little joy and people were very unhappy. They were conscious of living in misery. I can almost understand why at 50 my father went crazy. The weight of his family's history fell upon him and mowed him down." Sattouf's French mother "didn't speak Arabic and couldn't stand life in the village anymore. She separated from my father and moved back to France." Sattouf was catapulted from his village in Syria to the city of Rennes, in Brittany. Again, he was considered different. "In secondary school kids called me a dirty Arab. But somehow it didn't affect me as much as when I was called an Israeli in Syria. The biggest difference for me was being in school with girls! Later when I was in art school one of my teachers didn't like Arabs and said that work that wasn't done properly was called Arab work," Sattouf recalled. As a child Sattouf drew constantly, and avidly read the BDs that his French grandmother sent him to Syria. He says he always knew that he wanted to draw. After art school in Nantes Sattouf attended the Gobelins School for animation in Paris and hasn't left the drawing board since. He began to illustrate BDs while still a student until he broke out on his own and created his character Jeremie, who is in large part autobiographical as well although "all my characters are me, even the girls. It's pretty personal." Joann Sfar, one of France's star cartoonists, who illustrates and writes mainstream and alternative BDs worked in the same atelier with Sattouf and encouraged him to write Ma Circoncision, among other books. "I'd tell him stuff about my childhood and he couldn't believe it. I realized most people hadn't lived what I had lived. I decided to rid myself of this stuff and make some money, too!" Sattouf's particular brand of self-mockery in his libidinous anti-hero, Jeremie, (who one French critic termed as having "pathetic grandeur") but also in his childhood character in Ma Circoncision, has allowed him to evacuate many of his painful childhood experiences. In Jeremie the zany humor keeps the BD reading light. In Ma Circoncision, although the same humor is present, there is an undertone of real seriousness. It has also brought Sattouf full face with his feelings of identity. He says he no longer speaks Arabic but that he still reads and writes it. "I'd like to take up Arabic again to be closer to my past and come to terms with it. People just can't believe that I'm from Syria. But I think I'm much more of an Arab than a kid who is originally from the Maghreb." On the path to stardom in the BD world, Sattouf is juggling several projects at once. He is working on a series of comics for children, more Jeremie adventures, and stories from his Syrian childhood, which he'll publish this time in books for adults. While he doesn't feel "particularly at home in France", it is without a doubt the place for Sattouf to be. No other country would have published a BD as brutally funny and scathingly critical as Ma Circoncision. "Goldorak" is a Superman-type hero popular throughout the French-speaking world, including those portions of the Arab world formerly under French control, such as North Africa, Lebanon, and Syria. Riad Sattouf's Ma Circoncision is published by l'Association. You may be able to get a copy from abebooks.com and Amazon France. The French in this frame reads: "G ... Good bye. I would have liked to get to know you better." A Spanish translation is forthcoming; what is needed is an English version.